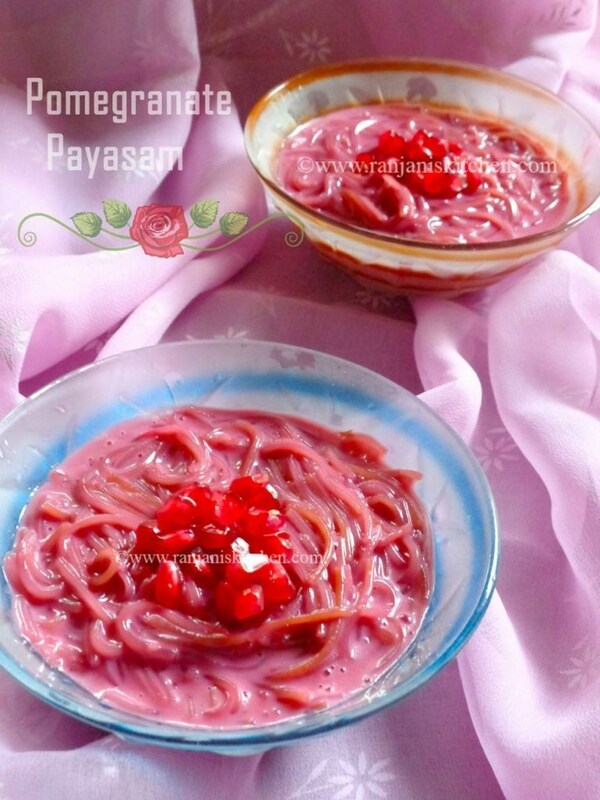 Pomegranate Payasam recipe to Wish you all a very Happy New Year. Start this year with confidence towards your goal. Hard work never ends in failure. Just forget the bad things happened in the last year, build all the bad things as steps to reach your destiny. I don’t have a belief in time and fate,its all in our hand. We cannot get all the loved things in life, but we can frame ours as a good example to others. So friends have faith in you and travel on your way. Let’s go for the recipe. Every start needs some sweet right ? Yes, its new year, so with a delicious recipe. 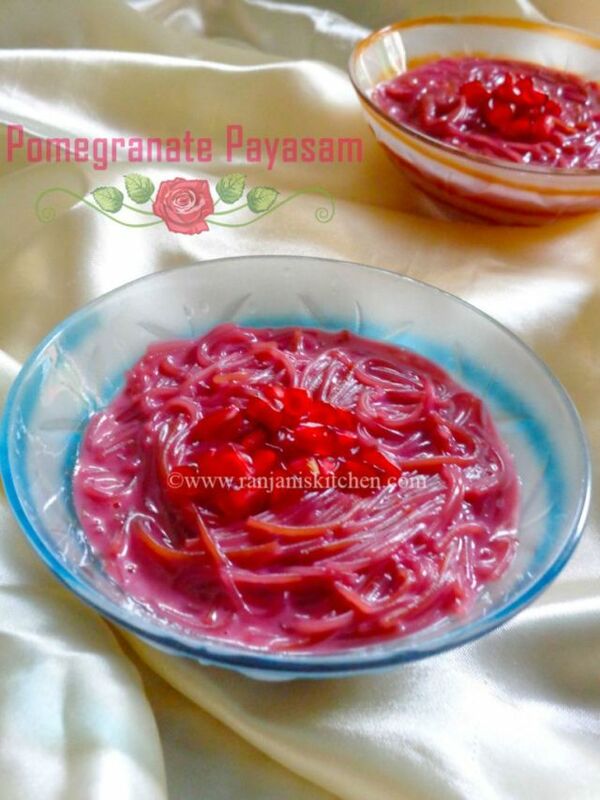 Pomegranate Payasam / Kheer recipes – Dessert recipes always make our palate complete. 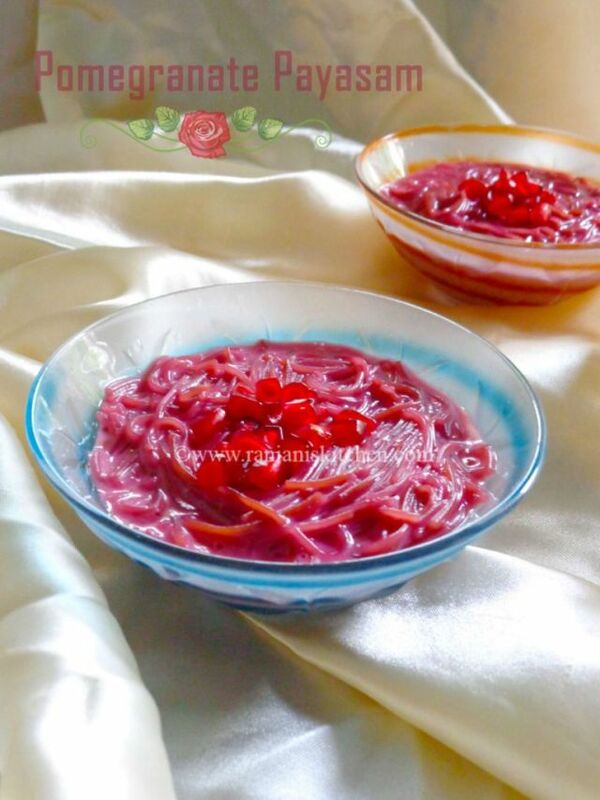 If getting bored with the same kind of Payasam, surely this Kheer cooked in pomegranate juice will make you enjoy . To add the richness of the kheer I added condensed milk. But I skipped cardamom, cosmos kind of usual adding’s in Payasam as it will make normal flavored. Remove the pomegranate outer skin, take off the seeds, keep 3 tbsps for garnishing, make juice with the remaining to the level of 1 cup.Keep it aside. Break the semiya/seviyan into medium sized, and measure for ½ cup. Heat a pan, pour ghee, keep the flame medium, add semiya and roast well till nice aroma comes. Then add pomegranate juice and mix well.Allow the semiya to cook in pomegranate juice for 3 to 4 mins. Add sweetened condensed milk and sugar to this mixture and blend well with a ladle. After it starts little thickening, add crushed almonds and food colour. Mix well and turn off the flame. Serve chilled, garnishing with pomegranate seeds. Adjust the sugar level if you are using sweetened condensed milk. While roasting seviyan, keep the flame low. Do not burn the semiya’s. We can replace milk in place of condensed milk. But the condensed milk will give rich and creamy texture to payasam. A pinch of salt will give a wonderful taste of any Sweet. So don’t skip it. But adding color is optional. For photography purpose I added food color, but you can skip it. Any kind of vermicelli you can use,break into medium size before sauting in ghee. Most of the semiya’s are double roasted, so for the flavor, give a mild sauté in ghee. Wow..my girl will live this coliurful payasam.